One of the most common uses of Scopus data outside of the SciVal user interface is that of institutional repositories and current research information systems. An Institutional Repository (IR) is a system for collecting, preserving, disseminating and promoting the intellectual output of an institution electronically. Roughly 80% of all universities worldwide have some sort of IR. The size and complexity of an IR can vary and is typically dependent on the institution's level of investment. A Current Research Information System (CRIS) is a database or other information system for storing data on current research by organizations and people, usually through some kind of project activity, financed by a funding program. CRIS databases are often connected to Institutional Repositories, whereby the CRIS system handles internal data aggregation and analysis, and the IR promotes externally what the organization is doing in terms of research and teaching. Also part of this landscape is VIVO (http://vivoweb.org/), an open-source tool for the discovery of researchers across institutions that has similar capabilities for showcasing universities, researchers and their output. The SciVal user interface allows a user to download SciVal metrics from anywhere in the application using the Export function, but this is labor-intensive for repetitive work. The SciVal API can be used to populate your IR/CRIS/VIVO more efficiently with a rich basket of SciVal metrics for your researchers and Institutions, as it enables developers working on IRs/CRISs/VIVO installations to write programs that automatically extract metrics from SciVal periodically, and add that data to their systems. -	Review the section on Authentication to get a better understanding of the authentication process. -	Review the IR/CRIS policy. -	Self-register for an API-Key here. The following is a good strategy that can be used to discover researchers and institutions, retrieve their SciVal metrics and how your system can stay up-to-date with the latest metric values. You can find the author ID in SciVal after you have defined your researcher or when exporting the Top authors list in the Overview or Trends module. You can use the author search in Scopus, which allow you to search there for author by name or ORCID, and browse through results. After the initial setup, it is much easier to for your IR/CRIS/VIVO to stay up to date with latest metric values available in SciVal. 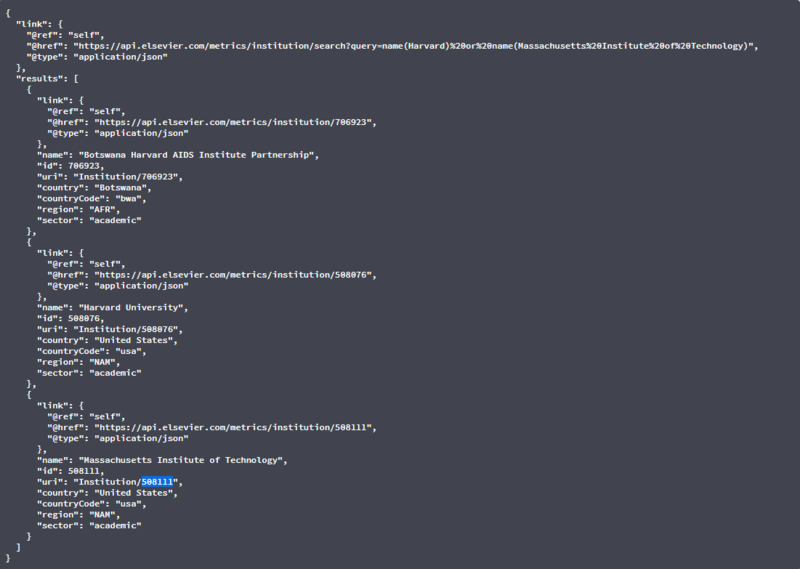 You can query the API to return the current metrics for your institution and researchers.